Self Adhesive Flooring Tape Black/Yellow. 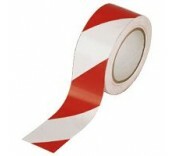 This self adhesive pvc tape is used for floor m..
Self Adhesive Flooring Tape Red/White. This self adhesive pvc tape is used for floor marki..